Worcester Cathedral is in the centre of the city of Worcester, which is situated on the banks of the River Severn, about 30 miles south-west of Birmingham. From either north or south, travel along the M5 and leave at Junction 7, onto the A44 and follow the signs to the city. From west or east, follow the A44 from Leominster or Evesham respectively. There is a multi-storey car park almost opposite the Cathedral. From London Euston with a change at Birmingham New Street, or direct from London Paddington. There are coaches from Birmingham to Worcester – it takes about an hour. 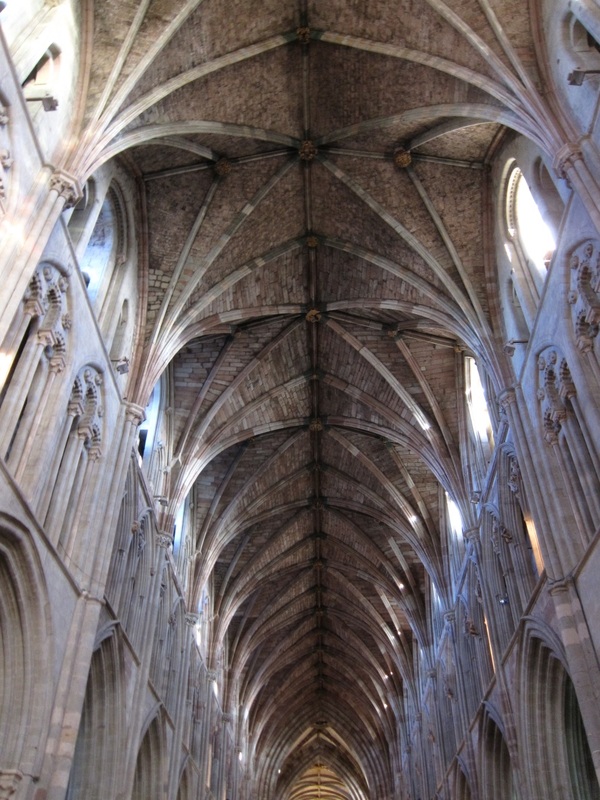 Worcester Cathedral is one of the oldest cathedrals in Britain, founded in 680 AD. Its mix of architectural styles make it well worth a visit. There are also two royal tombs to see and the glorious mediaeval cloister and chapter house from the original priory are still visible. Much of Worcester city centre was decimated, not by the Luftwaffe, although it was the location chosen to house the Government should evacuation have been necessary, but by the insane town planners of the 1950s and 1960s who destroyed the majority of the mediaeval city in the name of progress. The Cathedral and the College Green behind, home of The King's School, dating from 1541, form an oasis of history and grace. Exiting the car park and nipping smartly across the dual carriageway, the approach to the cathedral has been so hemmed in by buildings that it is difficult to appreciate its scale at first, and the mix of architectural styles. The tower is in the Decorated (c. 1280-1380) style, dating from around 1374. You enter through the north door which is in the Perpendicular (c. 1350 – 1515) style with carved figures. Immediately through the door, the nave is a mixture of late Norman surrounding the west window, Decorated in the centre section, and then early Norman (c.1066 – 1130) for the first transept. Moving up and down the aisles of the nave, there are numerous tombs and monuments to the great and the good of past times, including the great twentieth century composer Edward Elgar, Master of the King's Music, and (probably) the tomb of Sir John Beauchamp of Holt and his wife. 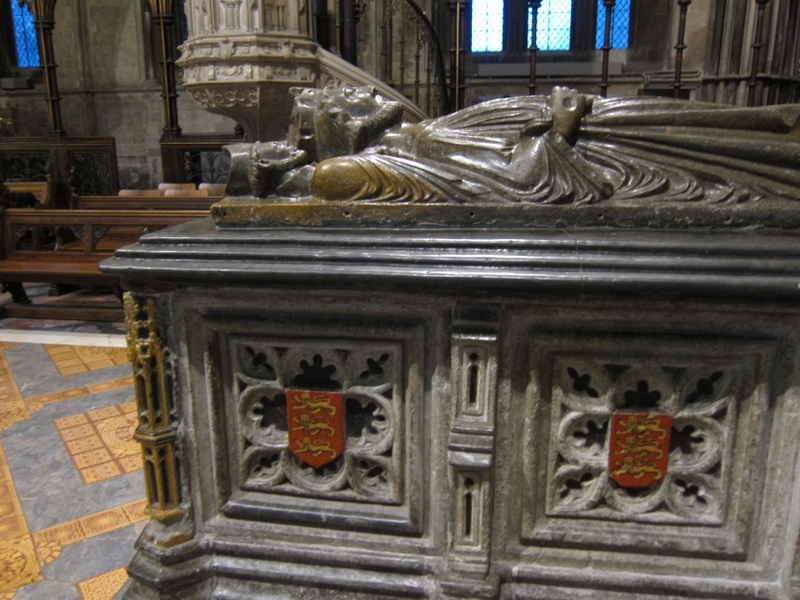 Other interesting tombs are those of the Mores and the Wyldes, sixteenth century merchants – I particularly loved the detail of the hem of Mrs Wylde's skirt - and Bishop Edmund Freake. Beyond the main transept, and through the Victorian Rood screen, the choir is a superb example of Early English (c. 1180 – 1280), dating from the thirteenth century, with the trademark Purbeck marble. 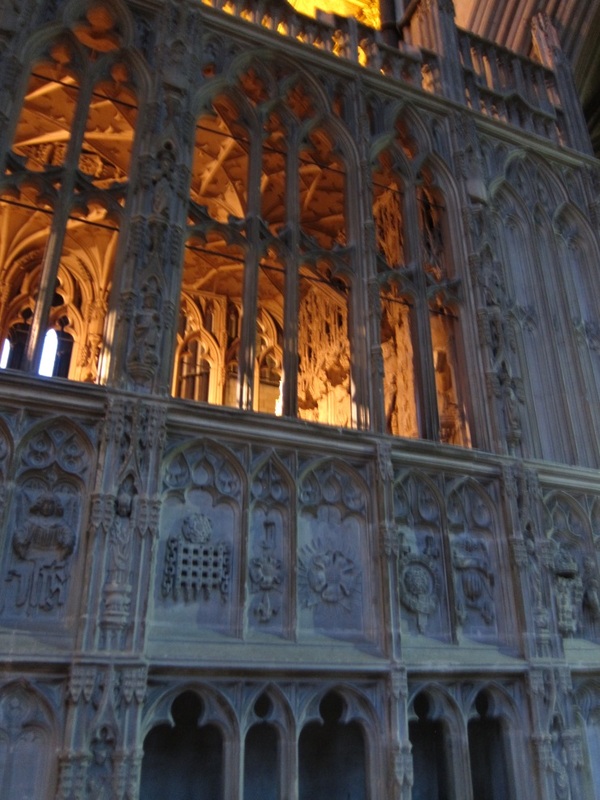 Beyond the choir stalls, where the famous and active three choirs of Worcester still provide the music for the Anglican services, is the tomb of King John, who signed the Magna Carta under duress. 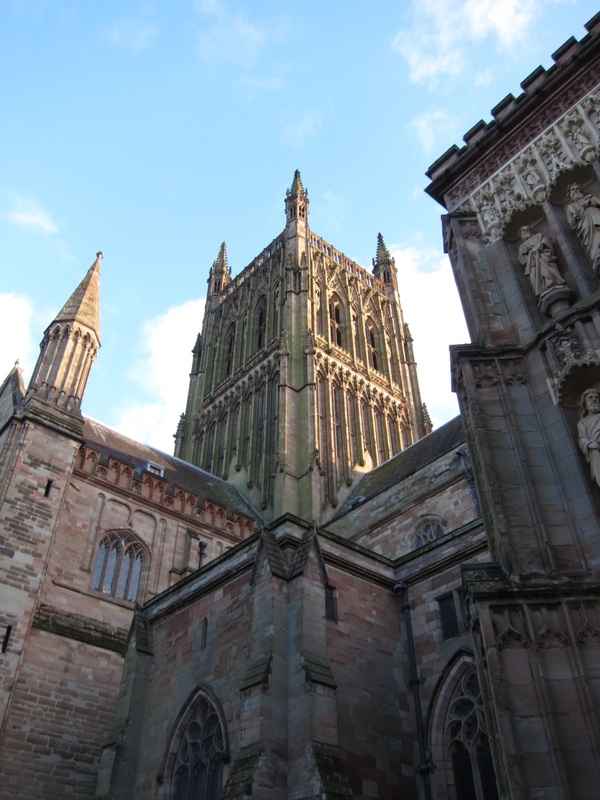 Worcester Cathedral is home to one of the copies of the Magna Carta, and there is a lovely facsimile to admire. 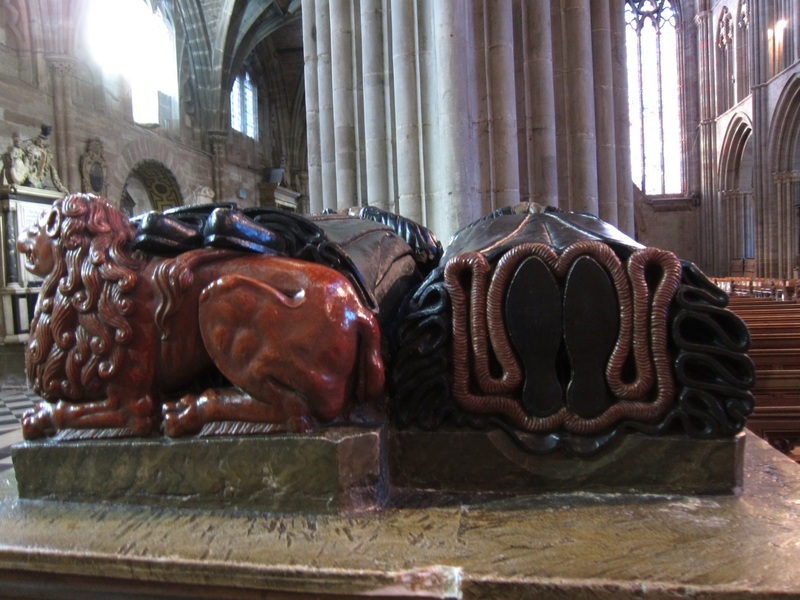 Despite dying in Nottinghamshire, King John expressed a desire to be buried at Worcester. Finally, just to the south of the High Altar is one of the final flourishes of English Perpendicular architecture, and late mediaeval religion – the chantry of Arthur Tudor, Prince of Wales.